Why need to Participate and Support it? Up until now, Komodo Island is still competing to achieve the most prestigious title in the world, as one of the new 7 wonders. Komodo island was nominated for the 4th place in the new 7 wonders few years ago, but currently its rank has dropped to the 12th place. No one ever knows how would the future would be like for Komodo Island. Could it achieve one of the new 7 wonders of the world or no? It all depends on every body’s support. The most important support are comes from Indonesian people it self. The total quantity of that animal currently only around 1900 animals. You can imagine if this giant lizard species vanished from Indonesia, big possibility it would be just like dinosaurs that have vanished from this earth long time ago. Our grand children will only know its name from ancient history. Those times would be different than our time right now, where we still can see the living Komodo dragon at the national zoo. Komodo national zoo has been established as one of the conservation area. As recognition for the world for its natural wealth, the National Zoo with total area of 1,817 km2 has been nominated as the reserves of humans and biosphere in year 1986. It also nominated for the world heritage sites by UNESCO in 1991. How to Votes & Support it? 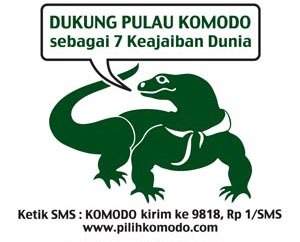 Therefore, if you one of people that read this, i appreciate you to involve in participating their vote for Komodo Island to be the new 7 wonders by simply typing KOMODO in your short messege and by sending its messege to 9818. Each SMS vote will be charged for Rp.1 per message. Up until now, there are around 10 million people have already sent their short messeges to support the Komodo Island to be the new 7 wonders of the world. Currently we are still looking for another 90 million more votes to support it. We still have several more days before all of the panelist of the new 7 wonders of the world will count the votes. The counting date will be on November 11th, 2011. For those who are still not giving their vote for Komodo Island, we urge those people to text their message and send it to 9818, Now! Do you want to see komodo lizard closely? Then, come to Komodo National Park, at East Nusa Tenggara island. Over there, we still can see a rare komodo dragon/giant lizard species. It is a wild kind of animal known with its latin name as Varanus Komodoensis. Komodo dragon has been well known as the giant lizard around the world. Komodo has its length around 2 to 3 meter long and adult Komodo dragon has its total weight around 70 Kg. Even when it has been maintained in captivity, most of the time komodo dragon would have its weight heavier than its usual. According to the record noted that the longest for this wild speciment is 3,13 meter long with weight of 166 Kg and 10 cm for its length of claw. This giant predator animal which live in Komodo Island, Rinca, Flores, Gili Motang, and Gili Dasami in Nusa Tenggara, has been found by a western researcher in 1910. Unfortunately, this animal habitat with a grim face is threatened with extinction due to human bad behavior. You can see image gallery on here. You can Vote in online too Now! Thanks for supporting and you have participated to save komodo for better future.